Cotinus 'Grace' In 1977, Peter Dummer, then propagator at Hillier Nurseries (Winchester, U.K.), hybridized Cotinus coggygria 'Velvet Cloak' X C. obovatus (a U.S. native). This outstanding cultivar was chosen from the seedlings and then was named after his wife, Grace. 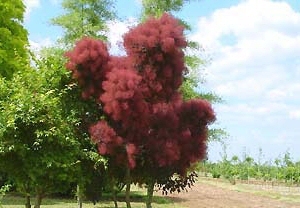 Cotinus 'Grace' is a deciduous shrub to 8 metres. It has much larger leaves than C. coggygria cultivars. Their colour is an intense wine-red when young, darkening to plum-red at maturity before they turn to an bright orange-red in the Fall. In summer, the shrub is festooned with masses of deep pink flowers. Smoke tree is best known for its hairy flower panicles in late summer. An upright spreading shrub, this vigorous shrub hybrid is intermediate between its parents, Velvet Cloak smoke tree and American smoke tree. Although each flower is inconspicuous, the flower clusters borne on long panicles appear fuzzy and light, like puffs of smoke. 'Grace' has extremely large pink panicles, 14" long by 11" wide. Its fruit is inconspicuous, but by fruiting time, May - June the flower panicles are showy. Fall color is a reddish purple for three seasons of interest. It is used in the home landscape. Purchasing bare root nursery stock saves you money. Shipped bare root, and packaged professionally to insure that your plants arrive on time and the best possible condition for planting in your area. Flowering: Blooming Growth Rate: Fast growth rate Plant Group: Shrub Plant Type: Deciduous Plant Zone: Zone 4, Zone 5, Zone 6, Zone 7, Zone 8 Size at Maturity: 10 - 20 ft Size at time of shipping: two year old plants. 6-12'' at time of shipping.